An exceptional, un-chillfiltered vatted malt: The Peat Monster. Combining the excellent, quite smoky Speyside Single Malt Armore, with the very peaty scotch Islay Single Malt Laphroaig, Compass Bow crafted an exceptional un-chillfiltered vatted malt, The Peat Monster. 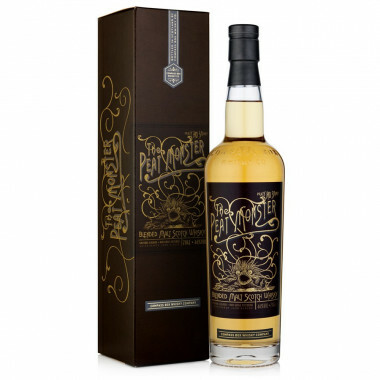 Very accessible and perfectly balanced, this whisky is quite a beast. Quite smoky, The Peat Monster does not forget its island origins and reveals the depth of Port Askaig malts, marked by an elegant smokiness as well as the southern island malts, showing an earthy, medicinal flavour. Matured in first fill and refill Bourbon barrels, the selected malts have been aged 10 to 16 years. Colour: straw yellow colour shimmering green. Nose: lively and precise. The first nose is quite phenolic and marked by citrus fruits and pears. Evolves on the smoke and the marine character (fish eggs) of Caol Ila creeps in progressively. When diluted, reveals notes of sweet almonds. Palate: extremely powerful. A frank attack on liquorice sticks, developing onto peaty bitterness and spices (pepper). Finish: long and lingering, over notes of an extinct fire.